We are having another amazing christmas giveaway. 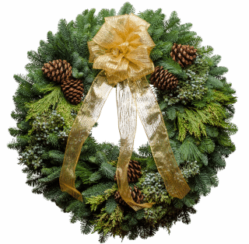 You can be the lucky winner to receive this 25″ Christmas Wreath. Of course, this wreath is Santa’s favorite…it was suggested by Mrs. Claus! This classy Christmas wreath features an organdy gold bow and gorgeous Ponderosa pine cones against an aroma-rich backdrop of Noble Fir and Princess Pine, juniper and incense berries. It’s sure to be your favorite, too! 1. Go to ChristmasGifts.com and choose a product you like. 2. Scroll down to the comment box under the product. 3. Type in your answer to this question in the comment box: What is your favorite Christmas Gift on Christmasgifts.com and why? Contest is open to residents of the United States only. My favorite on the site is Ravioli of the Month! My friends will remember me each time they have a delicious ravioli dinner! Godiva® Chocolate Gift Basket I absolutely love chocolate! I collect Christmas ornaments love the Reindeer Family ornament! I like the lavender bath and body set it’s my favorite scent ! My favorite Christmas Gift on Christmasgifts.com is the Grandma’s Heart Word-Art Ornament #8780714H because this would be ideal for my mother to have as a Christmas gift from her grandchildren this year . It would be cherished for years to come . My favorite Christmas Gift on Christmasgifts.com is World Art Ornament love the family means the world to me this be precious to pass onto my children start as tradition thanks you for this idea and new family tradition. I love Santa’s favorite Christmas wreath. It has a classic & beautiful look! Merry Christmas! My favorite gift is the Godiva Chocolate Gift Basket. I really like the Most Amazing Daddy T shirt because it’s so perfect for my husband!! I like the Embroidered Sherpa Blanket# E9610184X in Grey because I’m cold a lot and in need of a good comfy blanket.